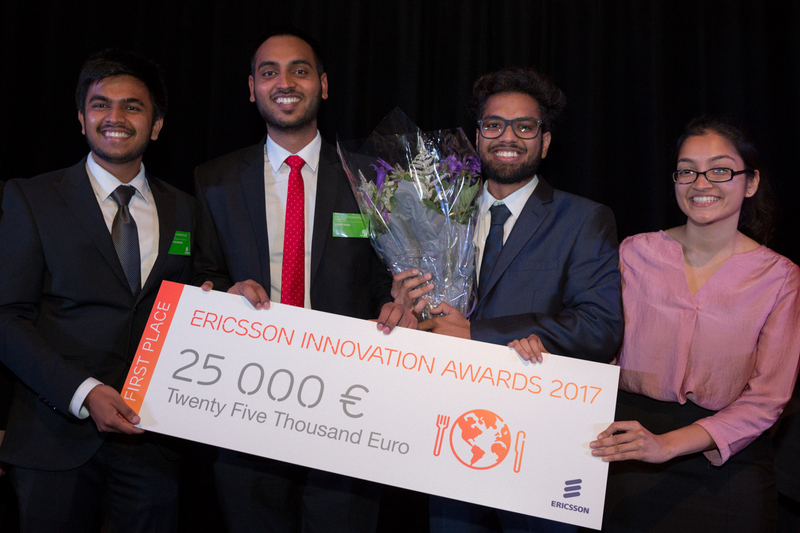 Ericsson (NASDAQ: ERIC) has announced that SNAP, from the Indian Institute of Technology Roorkee, is the winning team in the Ericsson Innovation Awards (EIA) 2017. The top three finalists competed in the EIA grand final held at the Nobel Museum in Stockholm, Sweden on June 12, 2017. The theme of this year's awards, 'The future of food', challenged students from around the world to explore how ICT can transform the way we produce, transport, distribute and consume food. By 2050, the global population is expected to reach 9.6 billion. Ensuring that food production and consumption is sufficient and sustainable is a major challenge, but also an opportunity to improve lives and the health of our planet. Börje Ekholm, President and CEO, Ericsson, says: "As our world's population rises, so does the challenge of ensuring zero hunger. This competition allows us to discover new technologies to transform our quality of life, food production and consumption. We continue to embrace and drive innovation and are devoted to the global ecosystems that support it." The jury for the 2017 Ericsson Innovation Awards was chaired by Sara Mazur, Head of Ericsson Research. Its members included: Caleb Harper, MIT Media Lab, Dr. Catherine Mulligan, Imperial College London, Mattias Fyrenius, CEO Nobel Media, and Johan Jörgensen, Founder Stockholm FoodTech. Second place - Enigma, India Institute of Technology Delhi. Enigma seeks to reduce weevil infestations in rice crop storage with a device that can detect the presence of weevils and the severity of an infestation, then spray pesticides accordingly. Third place - Foodgrid, Aalto University, Finland. Foodgrid is expanding urban agriculture and minimizing the distance between farm and table by building a social and commercial platform to connect urban farmers, landowners with green space, and consumers. The Ericsson Innovation Awards are a global, annual competition that gives students around the world the opportunity to develop new, innovative ideas in collaboration with Ericsson experts. This year, a total of 907 teams from 75 countries registered for the competition. Read more about the 2017 Ericsson Innovation Awards.